Tel Aviv is a extremely social, energetic, and very artistic city. You’ll find an exciting mix of food that is as diverse as its population. 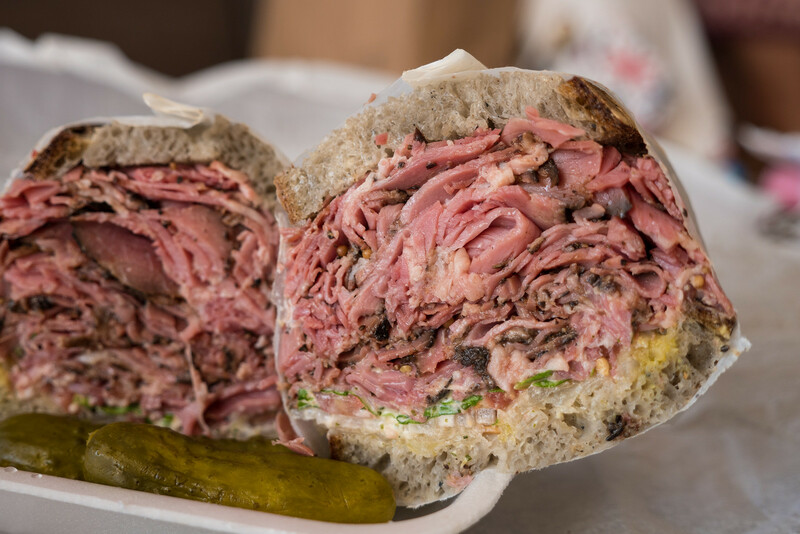 In this Tel Aviv food and travel guide you’ll find some tips on some must-eat food when you’re in Tel Aviv! 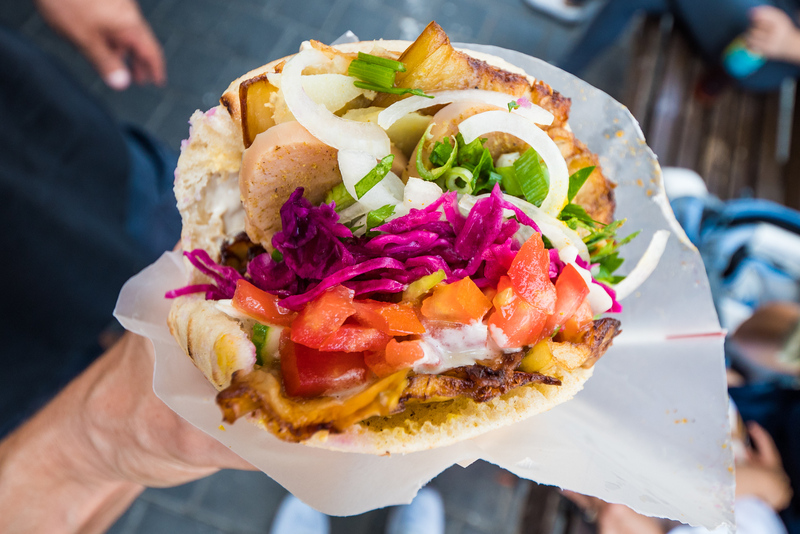 For the food listed below, I’ve only included the best restaurants and street food stalls I personally tried in Tel Aviv. Also, you can find all of this food within my Israel food videos. During my time in Tel Aviv I was honored to hang out and eat with my friend David, The Hungry Tourist, who is from Tel Aviv. He took me to some of his personal favorite restaurants in the city. Sabich is a Jewish Iraqi sandwich that includes fried slices of eggplant, hard boiled eggs, salad, and some sauces, all wrapped into a pita. Sabich Tchernichovsky does it probably the best in Tel Aviv, I was seriously blown away. 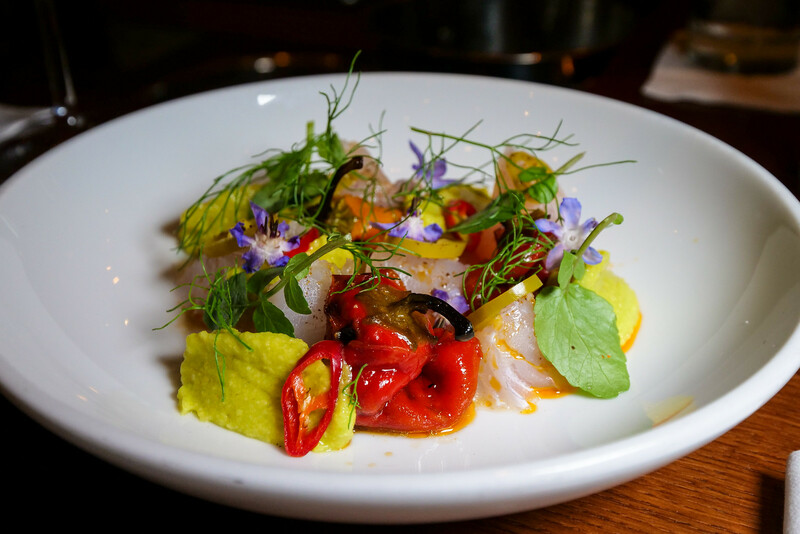 What I ate: Sabich with everything, it’s a stunner. Falafel Johnny Benin has stood the test of time for serving excellent fluffy balls of perfectly spiced falafel. I especially liked it because the falafel is always served hot and fresh. 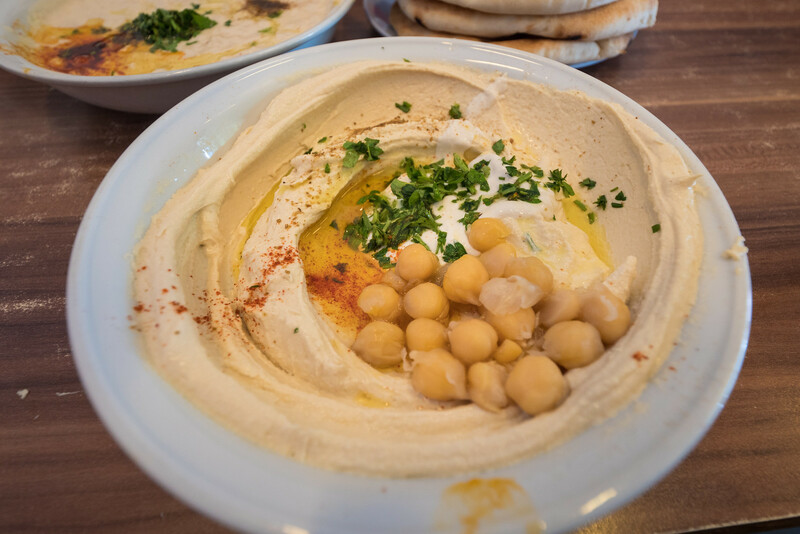 Abu Hassan is the most legendary place to eat hummus in all of Tel Aviv. They set the standard, and it’s absolutely delicious. What I ate: The hummus is excellent, but I also loved the musabaha, a dish of raw tahini and whole chickpeas. Started by legendary Chef Eyal Shani, Miznon is known for their “gourmet street food”pita sandwiches. You get high quality ingredients packed into a pita, and it’s amazing. What I ordered: I tried a few, but my favorite was the grilled chicken liver. The whole cauliflower is also excellent and genius. Address: They have multiple locations around Tel Aviv, and even locations in London and Paris (and more). Jasmino is a small hole in the wall grilled meat pita shop, that serves probably what was one of my favorite meals / snacks of my entire time in Tel Aviv. What I ordered: I had their lamb sweetbreads (thymus, bottom part of lamb throat) pita which melts in your mouth, followed by their sausage and kebab pita. You can’t go wrong. Carmel Market is one of the main central open air markets in Tel Aviv. You’ll find everything from souvenirs to an amazing selection of produce. There are some ethnic fast food restaurants throughout the market, and some street food stalls selling sabich and falafel. I was just looking for a quick lunch near to the apartment I was staying at, and came across Ruben. Turned out to be an awesome reuben sandwich. What I ordered: I had the 500 gram corned beef with everything. Chef David Frankel serves a mix of Italian and Israeli Mediterranean dishes at his Pronto Restaurant in Tel Aviv. The food is very delicate and for me the flavors were very subtle but came through. What I ordered: The oxtail cappelletti was awesome, and I also enjoyed the local seared fish. Ha Salon by Chef Eyal Shani is somewhere between a food science lab and a fine dining theater theater. It’s a very expensive restaurant, but it’s one of the most unique and exciting high end restaurants you’ll ever come across. What I ordered: David and I ate a variety of dishes, but the slow baked lamb ribs were the winner for me. To be honest, I spent just about all my time in Tel Aviv along with David eating. Everyday we had a full food schedule, so we didn’t have much time to do anything else but eat. However, one of my personal favorite things I did in Tel Aviv was just take an evening walk along the Mediterranean coast. The beach is beautiful, and Tel Aviv has such a laid back, artistic atmosphere. My wife and I rented a fantastic apartment on Airbnb for $114 per night (use this link to get $33 off your first booking, for the exact place I stayed search for “A beautiful apartment”). 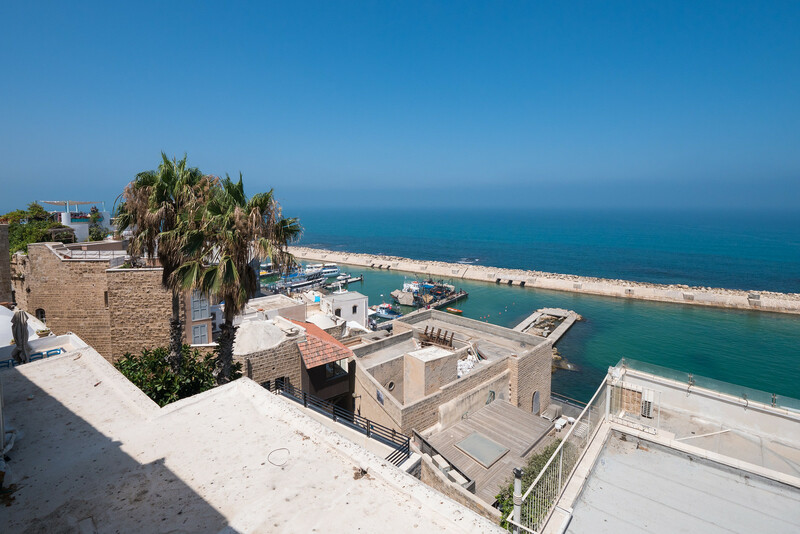 Tel Aviv is not a cheap destination and accommodation is quite high. Thank you for reading my Tel Aviv travel guide for food lovers. 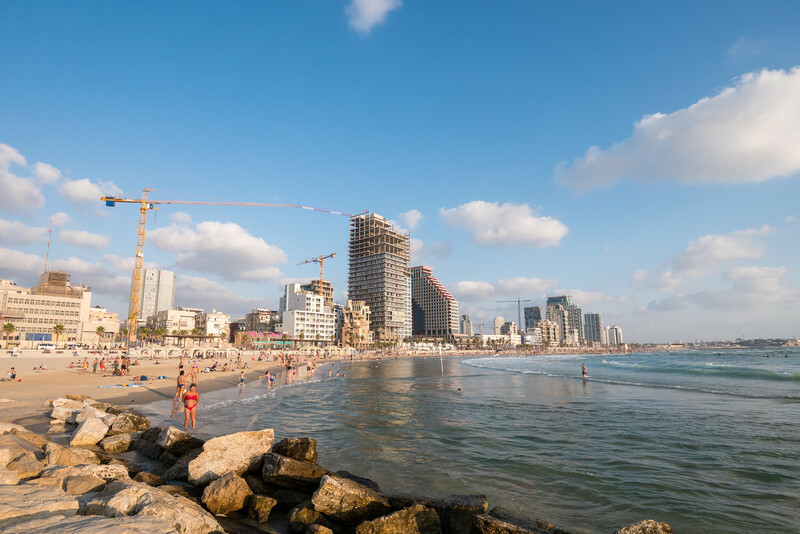 Tel Aviv is a vibrant city where there’s always something social and exciting to do, and lots of delicious food. For food, Sabich Tchernichovsky and Jasmino are the two restaurants that I would not miss in Tel Aviv. Thanks to David from The Hungry Tourist for taking me to these amazing restaurants in Tel Aviv. T-shirts: T-shirts available in the store.